1861/62 No. 7110, Havelock Street, house near the Depot, Occupier: J DENNIS, Owner: G SMITH. 1863/64 No. 12724, Havelock Street commencing south end, Wooden Cottage & Stable, Owner and Occupier: George SMITH. George and Melinda SMITH lived at 75 Havelock Street, Ballarat until their deaths in the 1890s. SMITH.- The friends of the late Mr George Smith, carter, are respectfully invited to follow his remains to their last resting place, the Ballarat Old Cemetery. The funeral cortege is appointed to move from his late residence, 75 Havelock street north, Soldiers; Hill, this day (Monday), the 23rd instant, at two o'clock pm. Thomas Wellington (Late F Atkins), Undertaker, 7 and 9 Dawson street south, just off Sturt street. The remains of the late George Smith, one more of the old pioneers who arrived in Victoria 1852, and a resident of the Ballarat district for nearly forty-two years, were interred in the Ballarat Old Cemetery yeasterday. A large number of friends attended the funeral. The following gentlemen were coffin-bearers:- Messrs John Kerr, James Wyatt, Joseph Johnston, and William Taylor; and the pall-bearers were:- Messrs James Scatcherd, A Adair, P Williams, W Gallair, C Cook, and John Downing. The Rev JJ Brown read the burial service at the grave; and Mr Thomas Wellington was the undertaker. 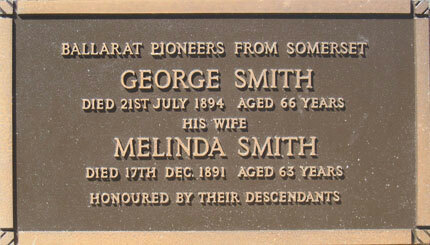 SMITH - The friends of Mr George Smith, carter, are respectfully invited to follow his remains of his late beloved WIFE to their last resting place, the Ballarat Old Cemetery. The funeral cortege is appointed to move from his residence, 75 Havelock street north, Soldiers; Hill, this day, the 19th instant, at four o'clock pm. Thomas Wellington (Late F Atkins), Undertaker, 7 Dawson street south, and at Geelong. 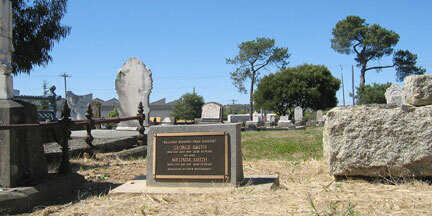 Graves of George and Melinda SMITH, Ballarat Old Cemetery, cnr Macarthur Street and Creswick Road. and the publication of a family history book.